Nature’s Miracle Skunk Odor Remover is quite effective, with an average rating of 4.6 out of 5 stars at PetSmart, but unless they keep some on hand at home, owners won’t have it when they need it. However, there is a highly effective solution that can be made from common household ingredients. The efficacy of this solution was proven by MythBusters experiments, which showed that it was even more powerful than commercially available preparations, whereas commonly recommended home remedies were relatively useless. Tomato juice just masked the smell and beer and vinegar did not work at all. If using the homemade solution, work the skunk odour remover into your pet’s fur, making sure to thoroughly soak it with the mixture. Leave the solution on for about 5 to 10 minutes and then rinse thoroughly with lukewarm water to make sure that there is no residue remaining on the fur. This process may need to be repeated a few times to completely remove the odour. This solution may bleach the pet’s fur, but the lighter colour will not be permanent. The fur will return to its natural shade once the cat or dog sheds and grows a new coat. Do not apply the solution near an open flame or other heat source. Be very careful not to get any of the mixture into the pet’s eyes. Make sure that the animal does not ingest any of the solution. Owners who have cuts on their hands should wear rubber gloves when applying the remedy. Dispose of unused portions of the solution immediately; it is unstable over time and if stored in a closed container, it can cause the container to explode. Usually skunk spray is just a surface problem because animals often close their eyes reflexively when sprayed so that none of the spray gets into their eyes. However, if your pet was sprayed in the face and did not close his eyes in time, he may suffer eye irritation. 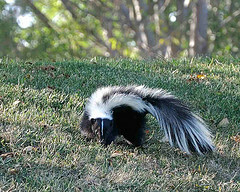 Symptoms of skunk spray in the eyes include redness, watering, rubbing at the eyes, and rapid blinking. If the animal has been sprayed in the eyes and cannot be brought to a veterinarian quickly, flushing the eyes with clean lukewarm water for a few minutes is recommended. Seek veterinary care if there are ongoing signs of eye irritation or the animal is vomiting. It is also a good idea to check for small wounds. Skunks usually just spray when they are frightened, but they do occasionally attack with teeth and claws. A small puncture left untreated can lead to abscess, and skunks may also carry rabies. If your pet has been bitten by a skunk, consult a veterinarian as soon as possible. Drs. Foster & Smith, Veterinary & Aquatic Services Department. (2010). “Removing the Smell of a Skunk from Your Pet.” PetEducation.com. MythBusters Results. (Aired 29 September 2004). “MythBusters Episode 16: Ancient Death Ray, Skunk Cleaning, What Is Bulletproof?” MythBustersResults.com. Tobiassen Crosby, J., DVM. (n.d.). “What to Do if Your Pet Has Been Sprayed in the Eyes with Skunk Spray.” VetMedicine.About.com.